The monument of Vasil Levski. His author is the Bulgarian sculptor Marin Vasilev. The main stone was laid down in 1903, and the monument was finished in 1907. Gina Kuncheva’s tomb– the Apostle’s mother, to the northern wall of the church “Saint Nikola”. Memorial of the murdered during the “Scary” citizens of Karlovo. 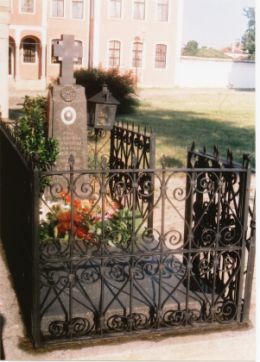 It is placed in the southern part of the church yard. During the Russian-Turkish War, 1877–1878, Karlovo and many settlements in the valley were sacked and ruined. Over 840 Karlovo citizens were slaughtered and hanged in Karlovo and Plovdiv from the regular Turkish troops and the bashi-bazouk during the six months period, called the “Scary”. Monument of the brothers Evlogi and Hristo Georgiev. 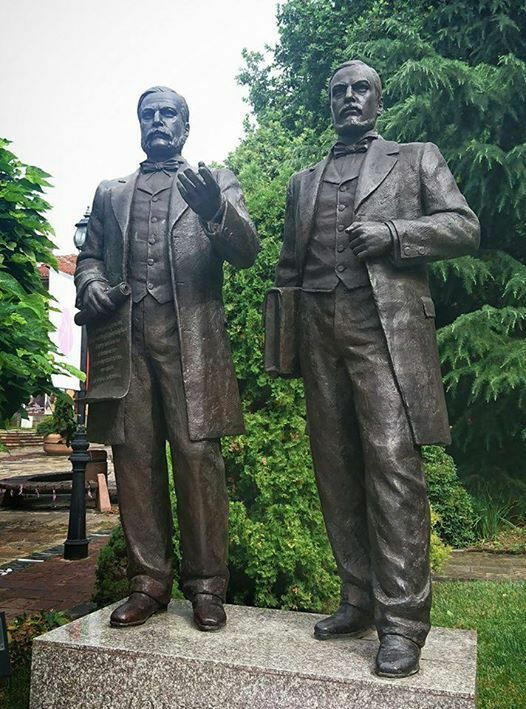 Evlogi (1819–1897) and Hristo (1824–1872) Georgiev are the greatest donors in Bulgarian history. The monument was built from Rotary Club Karlovo, on a project by the sculptor B.Borisov and architect P. Tsanev, and was opened on 3.10.2013. It is situated on Gurko Street, by the city center. Monument-fountain of Petar Yurukov. 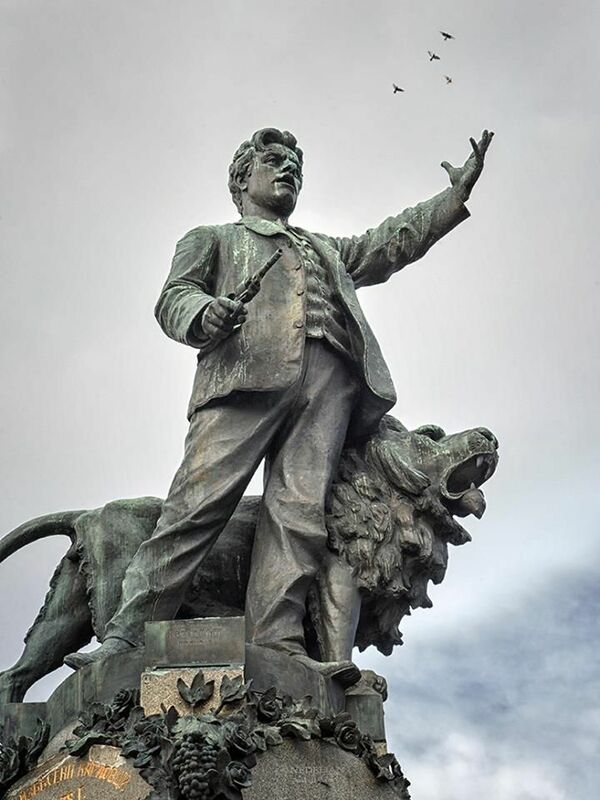 The monument of Petar Yurukov (1882–1905) – a Macedonian activist and chieftain of the Internal Macedonian-Adrianople Revolutionary Organization (IMARO), is restored in 2016 on a project of the young sculptor M.Stefanov and arch.D. Ahrianov; it is situated on Vasil Karaivanov Stree. 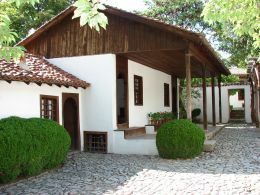 The “Ancient Karlovo”. Tourist complex includes five restored in their original appearance emblematic Revival houses of high artistic and historical value. The Suchurum Waterfall. In translation the name means “flying water”. It is situated on Stara Reka river at 1 km north from Karlovo’s center, at the foot of Stara Planina Mountain, over the city water-power station. The height of the water drop is 15 m. The waterfall is attraction for the visitors and favorite place for relaxation, walks and summer picnics. consecrated by bishop Arsenii in 2006. Here is the Three meters Cros, work of the Karlovo sculptor D. Rashkov. By the Cross, there is an icon of the Jerusalem’s Mother of God, which is believed to help cure different diseases. 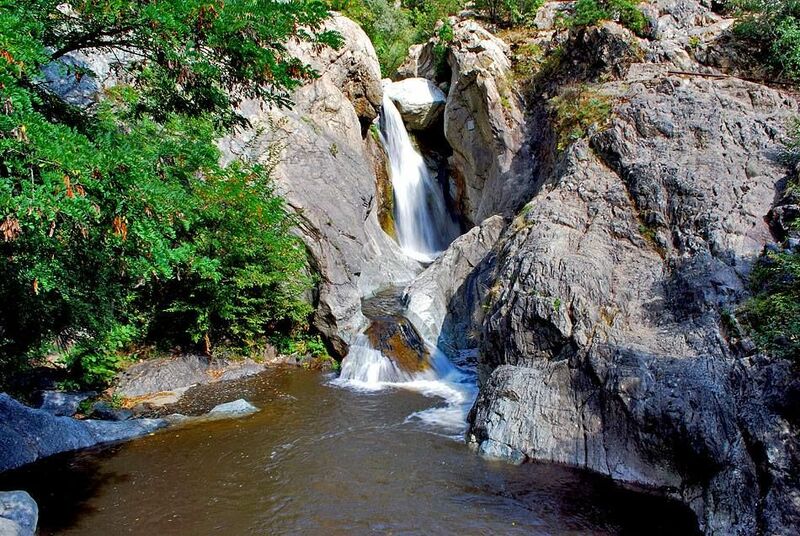 In 2004 was made a fountain with the image of the great Bulgarian alpinist Hristo Prodanov.